Google Chrome has skyrocketed in just a few years from an internal project at Google, to one of the most widely used web browser. At the time of this writing, Chrome commands over 30% worldwide market share (that includes multiple operating systems: mostly Windows and Mac OS X, but also Linux). "WebKit", the rendering engine that powers Chrome, is an open source project that is also used in Apple's Safari browser, and the latest versions of Opera. First, go to google.com/chrome - there, you'll see a big blue "Download now" button. 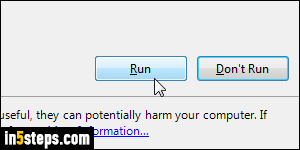 Click on it: it will detect your operating system and its version, and automatically pick the right download for you. 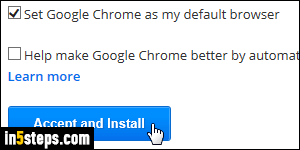 To keep your current default Windows browser, uncheck the "Set Google Chrome as my default browser" checkbox: you'll have the ability to easily change that later on. Optionally (!) read the terms, and click on the "Accept and install" button. The file you just downloaded is actually a small downloader/installer combo: click on the Run button when the confirmation dialog appears. If prompted to, enter the Windows administrator's password to continue. 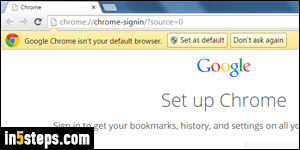 Within a few seconds, Chrome will be installed on your system and automatically launched. If you didn't choose to make Chrome your default browser, you can click on the "Set as default" button now - otherwise, just click "Don't ask again". The tab opened in front of you is the internal login page to sign into Chrome: if you use Chrome on different computers, signing in to your Google account from it would synchronize your bookmarks (websites you added as Favorites), your browsing history, and your settings (like the extensions you can install in the browser). 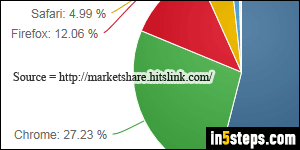 Out-of-the-box, Google Chrome is pretty barebones: the advantage is that it is extremely fast. But, like Firefox, it supports third-party "extensions". These are add-ons, or mini programs, that you can install to bring more functionality to the core browser. The downside of extensions, if you're not careful, is a breach of privacy and a slowed down web browser - choose them wisely! 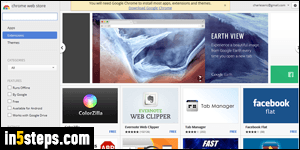 To view all the extensions available for download, go to the "Chrome web store".